Kristina grew up in southern Illinois, and was introduced to racehorses at an early age. Her first time on the back of a Thoroughbred was at 12 years of age, and she immediately knew what she wanted to do with her life. She was a student of Chris McCarron's North American Racing Academy, part of the second inaugural class. Following that, she galloped horses for top trainer Todd Pletcher. She took out her Jockey's license in late 2009, riding her first race at Churchill Downs. She then went to Tampa Bay Downs, where she was the Leading Apprentice Jockey for the winter 2010 meet before making her way to the Northeast to ride primarily at Suffolk Downs, Parx, Laurel, Pimlico, and Colonial Downs, where she was consistently a top ten rider, along with occasionally shipping in to Delaware Park, Penn National, Aqueduct and Saratoga. 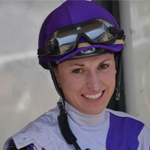 She suffered multiple injuries during her career, which resulted in her retirement on March 13, 2014 as one of the top female riders in the nation at the time with $4,648,421 lifetime earnings. Kristina now pursues her love of broadcasting with HRRN and teaches at the same school she attended, the North American Racing Academy.